We sat on the front step of our Flores hotel in the semi-dark, entertained by the cries of the neighborhood birds waking up long before the sun and fighting over who got to sit on the peak of the house across the street - apparently a favorite spot. The bus picked us up at 4:30am so we'd have a chance to enjoy the Mayan ruins before the heat and humidity of the afternoon made us miserable. Everyone was half-asleep during the first part of the hour and fifteen minute bus ride, but it didn't matter because we couldn't see anything out in the dark countryside. As the sky lightened, our local guide began explaining the history of the Mayan people and the importance of the 2,000 year old ruins. The bus trip was timed to arrive at the gates of the national park at 6am, just as they opened. The towering jungle on both sides of the 17 kilometer park road kept the ruins hidden from view until we pulled into the visitor's center parking area. Although our tour included a guide, my boyfriend had been there before, so we hurried off on our own to beat the crowds to Temple 4 - at about two kilometers distant, the furthest from the entrance. We paused about half way to catch our breaths and I took the above photo of the pyramid called Temple 1 before the morning fog burned off. 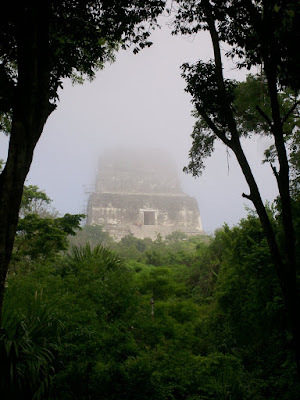 We next came to Temple 3, which has not yet been uncovered and allowed us to see what the ruins looked like when the first white explorers found them - really nothing but a steep rocky hill covered with trees and vines. At Temple 4 we climbed the wooden stairway as high as we were allowed to go and were surprised to see that quite a few people had beat us there. They must have been staying at the hotel that is located near the visitor's center. We were on a stone platform with "steps" where we could sit while we enjoyed the view. Terry told me that, in the old days, visitors were allowed to climb to the tops of all the pyramids and the best thing was to be on top of Temple 4 to watch the sun rise and set. Our perch put us above the jungle canopy with a clear view of the tops of some of the higher temples. Screaming howler monkeys sounded like some horrible creatures were coming through the jungle to get us. At times, they were loud enough that we had to shout to hear each other. We could have stayed longer but we had a lot to see, so we climbed down the long staircase and headed off toward the area called El Mundo Perdido - the lost world. It was interesting to wander around El Mundo Perdido, a large complex of almost 40 structures from many different periods with another large pyramid in the center. As we approached the Gran Plaza, Terry said he'd seen it all before and lay down on a bench in the shade for a nap while I climbed another long staircase up the side of Temple 2, the Temple of the Masks. Temples 1 and 2 face each other across the Gran Plaza, so I had a great view from the top back toward Temple 1 and to the many other buildings in this area. I wished I had been there in the days when visitors were allowed to climb the stone stairs of all the pyramids, but that was stopped because too many people fell to their deaths. As Terry enjoyed his shady nap, I went on exploring. As monkeys played in the trees nearby, I jealously watched people climbing up the actual stone steps of Temple 5 but by that time my thighs had decided that I'd climbed enough pyramids for that day. We spent the last hour before our noon departure following long paths to some of the less crowded areas of the ruins, enjoying the peace of being alone. I almost felt like a jungle explorer, but I was very happy that I couldn't hear the howlers any more.